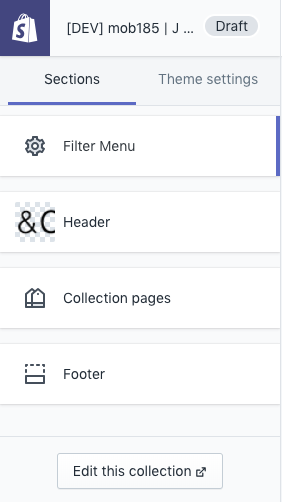 The Filter Menu has a lot of settings that you can adjust, including options for which components to show, fonts, colors, and design, as well as more advanced options for items like Accordions, AJAX, Apply buttons, and more. These settings are added to your existing theme settings, when you run the theme installer. To access these settings, in your Shopify admin, go to Online Store -> Theme and click on Customize on the theme that has the filters installed. You can also press the Edit Design button from within Power Tools, if your theme is live. You will see two tabs, one called Sections and the other is Theme Settings. The Sections area has a Filter Menu button, that is used to add colors and images for swatches. Most of the theme settings however are located under Theme Settings -> Filter Menu.